The last time I took a look at one of the Mammoth short story anthology, I was somewhat disappointed, as it didn't really fit the theme terribly well. 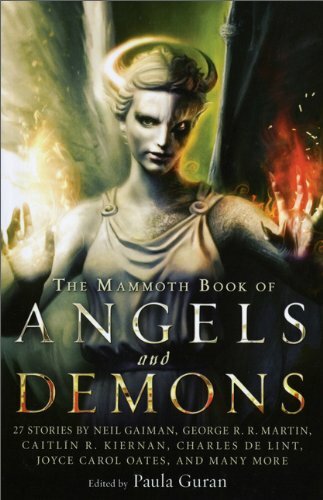 So I started The Mammoth Book of Angels and Demons with perhaps a little more trepidation than I initially picked it up with. But it did have stories by Neil Gaiman and George R. R. Martin, so I thought that there could at least be potential. The Mammoth Book of Angels and Demons is an anthology of short stories focusing on angels and demons, both traditionally Christian in origin and more modern reimaginations. First of all, and this might just be a personal gripe, but this is the first anthology where the editor has preceded each story with a snippet of information and a whole dollop of why this story/author is awesome, and it's really not needed. Rarely is the snippet of angelology or demonology especially necessary to understand the story, and it's really distracting to have the editor act as a hype-man. If you've included something in an anthology, I am going to take it as a given that you like the story in question, it doesn't need to be hammered home. As for the actual content, I found that the stories were generally more consistent in meeting the brief than my last Mammoth anthology. There were a few duds, of which the worst was easily "Only Kids are Afraid of the Dark" by George R. R. Martin. Considering that I was expecting his entry to be one of the safe bets, it was really disappointing to find such a poorly-written mess under his name. But while there were only a handful of outright duds, there were only five that I would actively seek out to read again: "Uncle Chaim and Aunt Rifke and the Angel" by Peter S. Beagle, "Sanji's Demon" by Richard Parks, "Oh Glorious Sight" by Tanya Huff, "Elegy for a Demon Lover" by Sarah Monette and "Demons, Your Body, and You" by Genevieve Valentine. Beyond those four and the handful of duds, the stories included were just kind of okay. I would have hoped to get a better success rate than 5 out of 27, quite honestly.